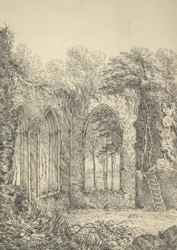 View in pencil of what was once the interior of Beeston Regis's priory. This Augustinian priory was founded in early 13th century by Margaret de Cressy or Isabel de Rye. The priory consisted of a church, monastic quarters and cloisters and accommodation for travellers. Its status was later changed to that of an abbey. As can be seen in the picture, the building had fallen into ruin by the 18th century.